I am 35 years married female with one kid. I am post graduate in literature from India. 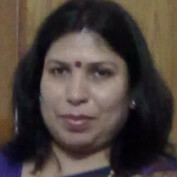 i am a home maker and have keen interest in writing and reading. When I was in college I used to write whenever I feel myself to express. I think life never ends whether you are alive or not. When you are not alive atleast your creativities are still last forever on this earth. Time and age can never be a hurdle for your creations so whenever you feel to do something, just getup and start.